When Jack Mulholland volunteered for service in Darwin in 1940 he was not sure what to expect. At first, for the anti-aircraft gunners, it was flies, heat, humidity, hard work, lack of women and entertainment and most of all boredom! Then one morning in February 1942 without warning the Ack Ack gunners were confronted with an air raid that caused major damage to the Darwin township and sank several ships in the harbour. 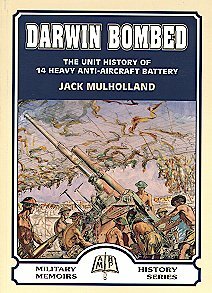 This is the unofficial Unit History of the 14 Heavy Anti-Aircraft Battery and looks at the way ordinary people coped with the hardships of life in the tropical north and how they reacted under fire. Jack Mulholland was born in 1921 at Hay, the family being stationed at Booligal, where his father was teaching at a one man school. He was educated at the Masonic Schools and Parramatta High School. He joined the Commonwealth Bank in 1938 and on turning 18 years of age enlisted in the 1st Light Horse Regiment. In 1940 he transferred to the 14th Heavy Anti-Aircraft Battery and was posted to Darwin where he served until late 1942. On his return to Sydney he completed the heavy A/A schools. At a later date he spent two months in South Australia undergoing infantry training and then gained his commission on Bofors (light A/A). After further service with heavy A/A, in 1945 he completed a three months conversion to infantry course in Victoria. He then spent a couple of months at the Jungle Warfare School, Canungra from where he was transferred to Sydney as medically unfit. He was discharged at the end of 1945 and rejoined the Commonwealth Bank at the beginning of 1946. Can anyone help me with more information?